User friendly programming is achieved via a colour touchscreen and intuitive software that is standardised across the entire Techne thermal cycler range. A USB port enables the transfer of programmes between instruments and temperature logs to your PC. A real time graphical display provides an instant visualisation of the program status. Gradient cycling can be achieved directly using the PrimeG instrument or by upgrading the Prime unit via a USB software installation. This enables the laboratory to manage changing cycling requirements in a cost effective manner. The Techne Prime cycler range is one of the most affordable full sized thermal cyclers on the market and is backed up by a 4 year warranty. 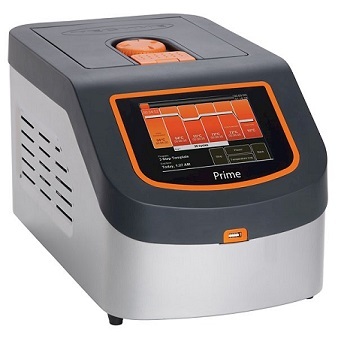 The PrimeG is a gradient enabled thermal cycler with all the features of the Prime unit. The wide linear gradient with a range of 29°C allows annealing temperatures to be optimised in one experiment. The gradient calculator function displays the temperature for each of the 12 columns, ensuring easy replication of thermal conditions.